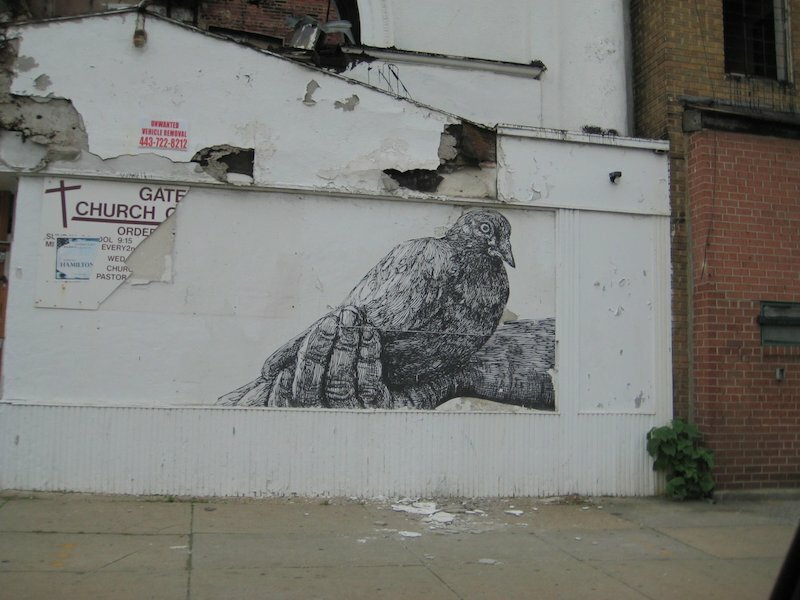 A wheatpaste by Gaia in Baltimore. Photo by Hank Mitchell. Baltimore-based street artist Gaia fell in love with Baltimore while attending the Maryland Institute College of Art, but he began his art career in New York City. Getting up in the right neighborhoods of New York City contributed to Gaia’s rise to prominence, but this was not the only reason Gaia became well-known so quickly. The work was compelling and he was putting his wheatpastes where photographers active on Flickr would see them. He also had his own Flickr account from early in his career where he posted his own work. Since moving to Baltimore, Gaia’s Flickr and Instagram accounts have become more important. Baltimore doesn’t have photographers like Jaime Rojo or Jake Dobkin seeking out his work on a daily basis and his New York fanbase doesn’t see much of Gaia’s work in person anymore. Today, Gaia’s fans go to his Flickr or Instagram accounts to see his work, which allows him to remain in Baltimore and stay internationally relevant. “If I was getting up in Baltimore without the support of the internet, I basically would have totally fallen off the face of street art,” he says, adding that many people simply assume he’s getting up in New York when they see photos of his work in Baltimore. Yet Gaia notes that the internet has pitfalls regarding perception. He claims it is easy for artists to create an illusion for an online audience that they are putting up a lot of work on the street, but only people in the artist’s city really know if he or she is active. On the flipside, an artist who does get up but doesn’t post many photos can give the impression to the international community that they aren’t active. Gaia takes a pragmatic approach to posting online. He has seen Flickr photos and blog posts lead to opportunities, and he knows that he’ll fall off of his fans radar if he isn’t posting anything, so he tries to maintain a constant stream of new content. In one case, a post on Unurth led directly to his work with the City of Philadelphia Mural Arts Program. Since Gaia can use the internet for exposure rather posting wheatpastes in Williamsburg, he can bring his art to a more diverse audience than if he were being similarly pragmatic in the pre-internet days. In doing so, he combines a concern for his own career with the street art ethos of bringing art to people who might not otherwise see it and improving neighborhoods. Although he agrees that putting up posters in New York “will always get you more attention than getting up in Baltimore,” he says, “I’ve made a commitment to Baltimore…” and notes that “usually I’m getting up in neighborhoods that never see this kind of work,” but that hasn’t destroyed his career. It seems that for Gaia, it helps to get up in New York or London from time to time, as that can remind people of his relevance, but putting up work elsewhere and posting it online regularly allows him to make only occasional visits to major street art cities while still maintaining his career.